The tauntaun has been on a roll in the past few weeks, what with the cake and the sleeping bag. 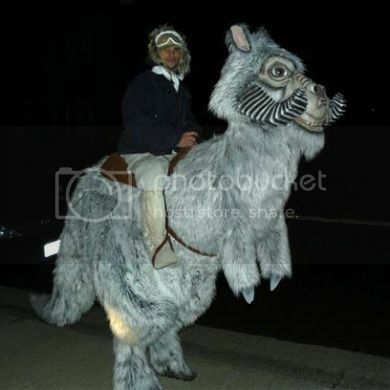 And now the Triumverate of Tautaun Triumph is complete with this amazing Star Wars tauntaun costume constructed by Scott Holden for a big radio-station-sponsored Halloween party in Sacramento, CA. I won’t bore you with details on the precision-engineered frame and stilts, custom-molded head, and faux-fur finish. Get your eyes busy with devouring the video of the final, ambulating product, below. Via Technabob, who likes his tauntaun medium-rare.